As many readers know, Vancouver passed what has locally been termed the Open3 motion a year ago and has had a open data portal up and running for several months. Around the world much of the focus of open data initiatives have focused on the development of applications like Vancouver’s Vantrash, Washington DC’s Stumble Safely or Toronto’s Childcare locator. But the other use of data portals is to actually better understand and analyze phenomena in a city – all of which can potentially lead to a broader diversity of perspectives, better public policy and a more informed public and/or decision makers. I was thus pleased to find out about another example of what I’ve been calling the Long Tail of Public Policy when I received an email from Victor Ngo, a student at the University of British Columbia who just completed his 2nd year in the Human Geography program with an Urban Studies focus (He’s also a co-op student looking for a summer job – nudge to the City of Vancouver). It was a group project I did with two other members in March/April. It was for an introductory GIS class and given our knowledge, our analysis was certainly not as robust and refined as it could have been. But having been responsible for GIS analysis part of the project, I’m proud of what we accomplished. The “Graffiti sites” shapefile was very instrumental to my project. I’m a big fan of the site and I’ll be using it more in the future as I continue my studies. So here we have University students in Vancouver using real city data to work on projects that could provide some insights, all while learning. This is another small example of why open data matters. This is the future of public policy development. Today Victor may be a student, less certain about the quality of his work (don’t underestimate yourself, Victor) but tomorrow he could be working for government, a think tank, a consulting firm, an insurance company or a citizen advocacy group. But wherever he is, the open data portal will be a resource he will want to turn to. 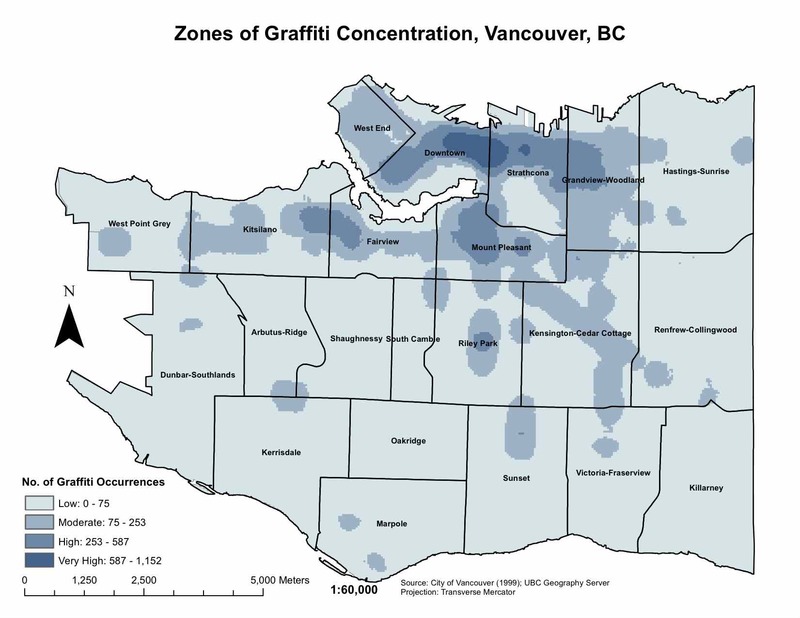 With Victor’s permission I’ve uploaded his report, Graffiti in the Urban Everyday – Comparing Graffiti Occurrence with Crime Rates, Land Use, and Socio-Economic Indicators in Vancouver, to my site so anyone can download it. Victor has said he’d love to get people’s feedback on it. And what was the main drawback of using the open data? There wasn’t enough of it. To translate: essentially the city releases this information in a non-machine-readable format, meaning that citizens, public servants at other levels of government and (I’m willing to wager) City of Vancouver public servants outside the police department have to recreate the data in a digital format. What a colossal waste of time and energy. Why not just share the data in a structured digital way? The city already makes it public, why not make it useful as well? This is what Washington DC (search crime) and San Francisco have done. I hope that more apps get created in Vancouver, but as a public policy geek, I’m also hoping that more reports like these (and the one Bing Thom architects published on the future of Vancouver also using data from the open data catalog) get published. Ultimately, more people learning, thinking, writing and seeking solutions to our challenges will create a smarter, more vibrant and more successful city. Isn’t that what you’d want your city government (or any government, really…) to do? This entry was posted in canadian politics, open data, vancouver and tagged government, open, open data, public policy, technology, the long tail, vancouver on May 21, 2010 by David Eaves. Kudos to Vincent and his group on their work; I'm looking forward to reading it. Such a timely topic as well.I'm intrigued by the conversation we can have when, on the one hand, we have an analysis like this, then have on another, the perspective of the people at the heart of that matter: the people doing the tagging and those who are victims of it. This article in the Georgia Straight describes the recently-cut graffiti management program from the City of Vancouver which was using restorative justice to give taggers a new lease on life:http://www.straight.com/article-324713/vancouve…This is a conversation that might previously have been restricted only to experts; and we can have it now because of open data (and good journalism). I think that's pretty cool.Yesterday's URISA seminar on open data also featured other examples of use of open data; hopefully the authors are interested in sharing their experience more broadly online as well. That's interesting, we weren't aware of the Restart program when doing our project. It's very unfortunate it's being scrapped, along with the remainder of the city's graffiti management program. And to further comment on the crime statistics: the data is certainly there (as indicated by the maps) and it would be great if the VPD could publish it in a structured way. The summary tables in .pdf are good by themselves, but it only provides just that, a summary, and fails to reveal further geographic differentiation. In hindsight I would have contacted the VPD and see if they would provide the raw data. But ideally, I shouldn't have to. The Ottawa Police Service does a great job in this area. They partnered with CrimeReports.com and provide a map showing all crime incidents:http://www.crimereports.com/map?search=Ottawa+O…And if you click on the link at the bottom, “VIEW CRIME INCIDENT DATA”, it shows the crime type, a short description, address and the date it took place on.